Thursday, the team and the girls piled into a van and went to Isla Negra. Bill, our intern Diane’s father, came for a visit and not only joined us on the trip but also worked hard on the construction. Daniel, Jessica and Anais went in their car as Jessica definitely is “great with child!” Our first stop was a beautiful, rocky section of the coast just below the Poets House. One could stay there forever and commune with God! After lunch, we took a tour of the Poets House. Pablo Neruda was the first poet of Chile to win a Nobel Prize for Literature. His artistic nature came out in his home and in his collection of things. The house has one section built to give you the feeling of a ship and another to give the feeling of a train. His collections include ship figureheads, telescopes, smoking pipes, sea shells, compasses, portraits of other poets, a train engine and many other things. Not sure if we can incorporate what we saw into the House of Hope! Afterwards, we went to another beach that has penguins. Unfortunately the penguins were not there when we were. We were told by two different people that they are there on Saturday and Sunday. Cynthia saw them there during her summer vacation. Some of the girls went swimming in the cold Pacific Ocean but none of us gringos! Friday, we prepared for painting, finishing the tar paper, joist hangers, shimming ceiling joists and the electrical ditch for the Saturday volunteers. We ran out of sand, cement and bricks for the ditch due to having to build our own “camaras.” (See the other updates concerning cameras.) An order was quickly made and delivery was to be 3:00 pm. At lunch we bought two bags of cement at the corner hardware store and scrapped up sand from where the sand piles had been located. We took brick out of the ditch so Jose could build the final camara. Friday night we had a barbeque and concert. 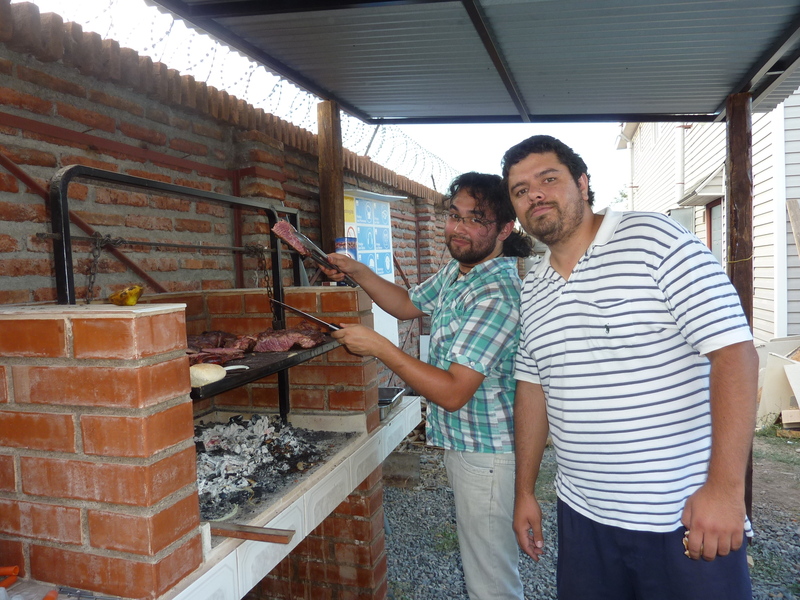 Italo and Daniel were the masters of the barbeque while the girls and Jessica made many great side dishes. It was a wonderful, relaxing time. Chorizo (a type of sausage) is great! We had a special concert with Italo playing the keyboard; Pauline playing flute; David, Pablo and Jessica playing guitar; Daniel playing drums and a friend of Daniel playing bass guitar. A lot of talent and fine singing! 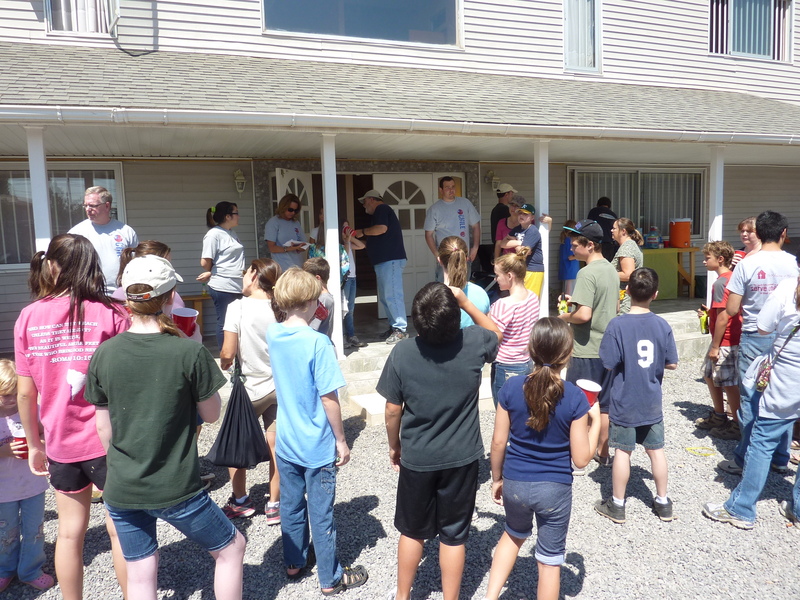 Saturday the volunteers arrived and were divided between four building projects and the feeding program. Again, the volunteers were able to complete much more than the team could complete alone! The one small problem was – still no cement, sand or brick. Actually, there was no more brick in La Pintana! Daniel drove to Sodimac and was able to buy 200 brick. Everything arrived around noon. In the next hour brick was placed back in the ditch and the ditch was filled in – all before lunch at 1:00! Did I mention how great the volunteers are? Each of the girls helped paint their own room. Sometimes, though, it appeared they were painting themselves! Paint must splatter more in Chile! Five rooms were basically completed Saturday and we have the paint for the other five. Lee painted until we left for the airport! It is good to be home with our families again! The girls, Daniel and Jessica are all exhausted and ready for a break! We did leave David in Chile with an ever growing list of small jobs, some needing done since the building was dedicated! We thank each of your for supporting us in prayer and for supporting the work of Vision for Chile financially. Two additional girls were interviewed while we were in Chile about entering the House of Hope. The TransVip van driver thanked us as he dropped us off at the airport for what we are doing in La Pintana. God is good! Vale, David and Lee were able to visit in two homes one evening. They shared Christ with four people, each of which prayed to receive Christ into their hearts with tears flowing! Lives are being changed in La Pintana! We have an opportunity to send another team in October. Would God have you go? Would God have you give towards construction or the monthly expenses? Would your church like Tom Orme to come and share about Vision for Chile and short-term missions? Would you pray? We would love to have you! If you go to the Annual Council of the C&MA in Tampa, stop by our booth and visit! Next Post October 2013 trip.